August 2011: Martinsville resident R.D. Harris began his real life's work after he retired from Dupont. 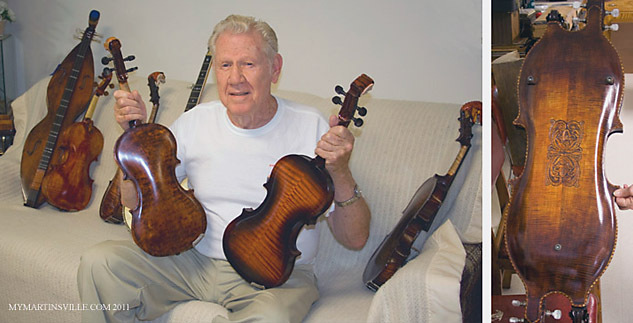 At age 60 Harris began making violins. In the photo above Mr. Harris is holding 2 of his creations. The striped back pattern on the viewer's right is the famous Tiger Maple wood grain. This original log of Tiger Maple was cut in Spencer and intended for firewood until someone mentioned the wood's unusual pattern to him. It was the rare Tiger pattern stripe and he brought it home to use in his work. Only 1 in 1000 maples might have this unusual pattern. Another violin is carved from a split short log of Red Spruce taken from White Top Mountain in Greyson County. R.D. is from Wythe County and grew up just east of Wytheville where he loved to roam the hills and hunt. He especially liked to hunt grouse and in his office he has a stuffed grouse that he shot in Catawba. He came to Martinsville and worked at Dupont until he was 53. His Harris family can be traced back to the very beginning of our country: his earliest ancestor settled at Malvern Hill near Curls Neck in 1611. This was Thomas Harris, born in England in 1587. Thomas' son William moved up the James a ways beginning a family tradition of moving west. This was the Major William Harris who traveled west to the Blue Ridge with the famous explorer John Lederer. R.D. Harris was very active in local historical research especially related to indian ruins in Henry County. His name is nearly lost to history in that regard, being overshadowed by that of Richard P. Gravely. Many famous fiddlers use his violins: Montana Young, Timmy Martin. He sells very few of his creations; mostly they are used by his musician friends. A comparable violin would likely sell for $2500. 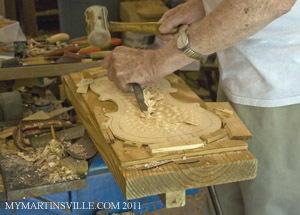 He is the only fiddle maker in the Henry County area. Although violins or fiddles are his specialty he has also made 1 banjo and it is modeled after a 1920's era violin called the "Whyte Lady". In the middle picture at top is the carved back of a dulcimer built by R.D. and played by his wife JoAnn. Find R.D. at the jam session on Friday afternoons at Fieldale Antiques; he plays the violin.